To say that Tim Tebow has his share of critics is an understatement. The deeply religious young man was the consummate college football player at the University of Florida. Leading the team's “option" based offense to become BCS Champions in two of three years, Tebow's detractors said his game would never transition to the professional level despite being the first quarterback in NCAA history to rush and pass for 20 touchdowns. 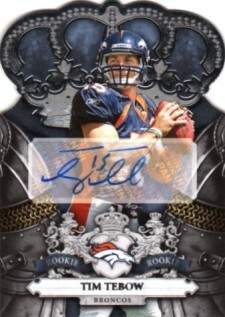 In so doing, Tebow also became the only sophomore to win the league's coveted Heisman Trophy. His college accolades include being a three-time All-American, three-time SEC All-American, the Associated Press' Player of the Year and NCAA Quarterback of the Year. The characteristics that made Tebow a successful and winning college quarterback weren't things that could be taught: drive, dedication, passion, leadership, resilience, intelligence, focus, and determination. Perhaps that is why the Denver Broncos shocked NFL fans, analysts and critics alike by selecting him in the first round (25th overall) of the 2010 NFL Draft. Team spokespersons at the time sighted the fact that of all the things like footwork and arm strength that analysts said would prohibit Tebow from successfully taking the next step to the pro level could be taught. In the wake of a public feud between then starting quarterback Jay Cutler and new coach Josh McDaniels, the team had nothing to lose. Or so it was thought as there has been no clear commitment on the part of the team to outright label Tebow as their number one quarterback. The son of foreign missionaries, Tebow's desire to excel on and off the field keep him well grounded and an inspiration to his fans and even objective detractors. A product of home schooling, Tebow has been a vocal advocate of greater access to athletic facilities for home-schooled athletes and, as a result, several states have introduced legislation for that purpose. 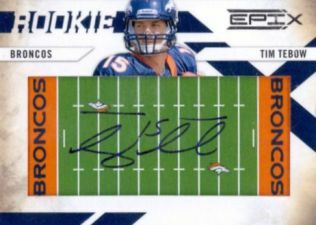 As a result of his impeccable college career, hopes are high for his collectibles, as reflected in the values of his rookie cards and autographed memorabilia. Coming from an SEC powerhouse like Gator-nation certainly doesn't hurt either. 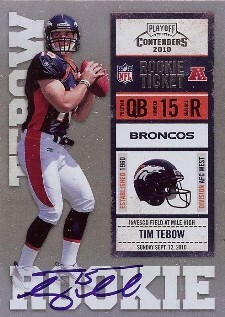 All of Tebow's rookie cards, of which he has 35, hail from 2010 products. Available at any price, collectors have a good mix of cards to choose from. 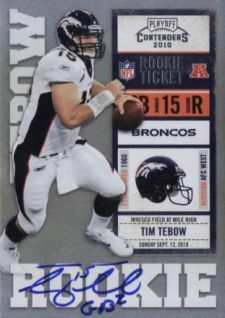 Additionally, Heisman-related items or team items from Tebow's BCS Championship years with his signature remain in high demand among both college and football collectors alike. 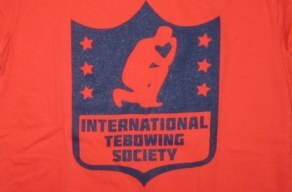 Check out the 10 strangest Tim Tebow shirts on eBay. 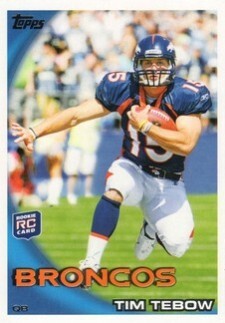 I have a Panini Tim Tebow card and he is in a New England uniform. What is that worth? 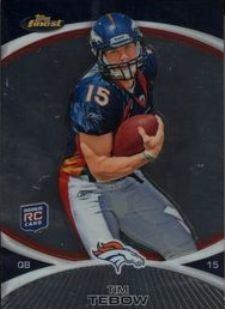 Tim Tebow former NFL & Florida Gators QB football 4X6 photo card RP auto LOT X2!